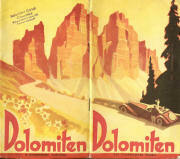 Travel brochure for "Dolomiten: Den Flammenden Berge," 1935, published by the UTA, Merano. Signed Franz Lenhart, designed by Pizzi & Pizio, Milano. Travel brochure for "Merano das ideale Standquartier für Ihre Sommerferien," signed Franz Lenhart. Advertisement for the SAD - Società Automobilistica Dolomiti, 1935, signed Franz Lenhart, from a travel brochure. "Gide Automobilistiche nelle Dolomiti (Automobile guide to the Dolomiti," published by the "Ufficio Viaggi Flli. Molinari, Colle Isarco," (Tourist Office Molinari), circa 1930. Signed Franz Lenhart. Travel brochure and schedule for the Società Automobilistica Dolomiti, circa 1934, signed Franz Lenhart. Advertisement for the SAD - Società Automobilistica Dolomiti, 1937. Unsigned. Travel brochure for "Wintersport in den Dolomiten," 1934. Published by Ente Nazionale Industrie Turistische (ENIT - Italian State Tourist Department), signed Franz Lenhart. Travel brochure for the Dolomiti, 1924, published by the Gazzetta del Turismo - Trento. Printed by Fuscio & Paduano - Trento, design A. Scotoni.